All aboard the tiny train! All aboard! We’re taking the train through Taiwan, and our next stop is the Taichung train station. The station began operations in 1908 and was closed down after an elevated station was built and opened in 2016. 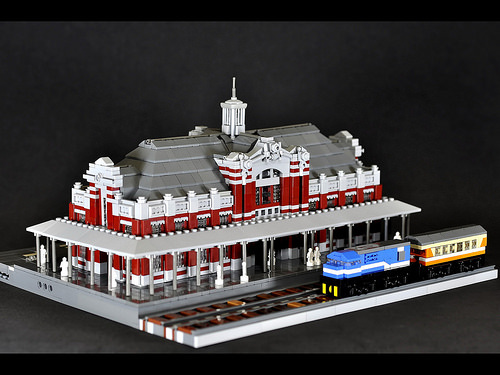 The original station is a beautiful piece of architecture, and Maxime Cheng’s microscale rendering is superbly detailed. His model is rich in texture, right down to the ornate architectural accents along the perimeter of the roof. While the building itself is stunning, the tiny train is an equally impressive-looking feature that really helps bring this model to life. Dare I say, Cheng’s Taichung station feels like it would be a great companion to sets in LEGO’s Architecture series?